Yes a lovely one Karen...happy December! There She is, with the December "Look Of Love"! Thanks Karen! A lovely stage one for today. Just to remind us of Dusty at RAH. This is beautiful Karen. The look of love indeed. Thats better!Thanks everyone whos posted lovely pics. That's a lovely picture, Karen! Youre getting better at this Karen, lovely shots! Trek, Karen & Samuel - beautiful pictures, thanks for posting! I like this one Karen. That looks like a new one to me Samuel, well done. Think you are right Samuel, looks slightly different to others we have. Well done! Gives her sort of a professional, executive kind'a look doesn't it ? From Continental Dusty. San Remo, I believe? Great find, I hadn't seen these before! They look very familiar Frans, but maybe sharper pics than I have seen. Thank you. That is a nice one Liz. It would be nice if we could get it a bit bigger. One stage one for Sunday! A lovely one it is too! One to keep me happy for today! She does just that doesn't she Cas. Cas19 wrote: One to keep me happy for today! Do you think this is the same stage? Looking at them again..its not as the hair is different!! Last edited by neonouille on Thu Dec 23, 2010 11:53 am, edited 1 time in total. The second one is quite common Samuel, but the other one I don't feel I have seen before. I've seen lots of similar shots but no not that one. So thank you. Sorry! 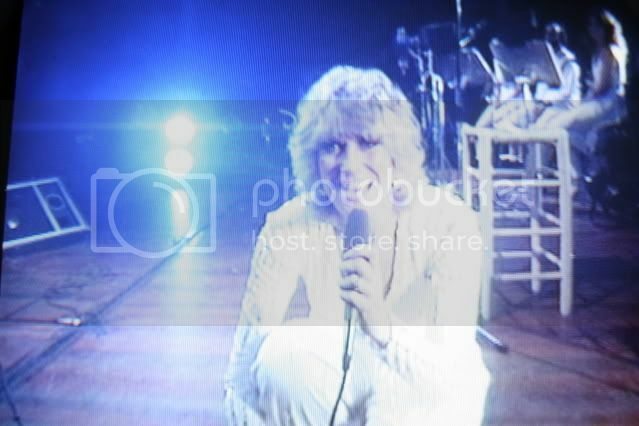 In fact the pictures are on GettyImages. Forget the ''not very common''. "Are you ready for a brand new beat?" Oh, It must have been fantastic to see her singing this live, Liz! I like it too Karen, its one we've seen like you say, but do we care...nah! I don't think I've seen the picture before.. Thanks Karen! Dusty looks lovely here! Haven't seen this one in a while...or have I?! Well done Karen....5,000 and climbing! It doesn't matter if we've seen them before, they're as lovely as the first time! Agree Cor , never tire of them.. very involved in SOAPM here..
That ones VERY closeup Karen! Who can tell me what shes singing here? Never seen that one before Cas! The microphone looks sort of like the one she used in her TV series or on the Tom Jones Show, but I don't remember seeing that hair and that blouse together before. Her hair looks slightly untidy, like maybe she'd stuck the wig on for a rehearsal.......but I'm probably totally wrong! I'd say ICMEACTT. Any info with it? Spot on Carole! The only bit of info is that its saying shes appearing at 7:30pm on the Tom Jones Show! Excellent. I've no dates witout looking in the Bible! How do you do this, Carole??? I love her face on this photo! She's cute! Cas19 wrote: Love this one. This is a great dark turtle-neck photo, but it's cropped a little tight. Is there another shot from this one? Today a girls neck-line plunges all the way to the pubic mound ! Watch my video with Dusty on YouTube! ""YOU DON'T HAVE TO SAY YOU LOVE ME"
A blue one for today. She just needs a little help counting to 10!! I know lots of you don't care for this style of wig, but well I do! Not one for details Samuel! Sorry, someone may know. heres another, not a style she kept for long,not popular. I repeat: I like this style of wig! But why don't we have videos with these wigs? Yes I think we are in the minority Samuel in liking this style. A slight variation on the style. Dusty always in style with her "coupe au bol" I like it very much! The last one is really cute. But the red wig is just a little too.... well, red. I like them too Samuel, a couple of new ones there too. Thank you. Yes it is a very lovely one Karen. Samuel, well done for getting rid of the text that's usually stamped all over the piccies! I love the movement in the stage ones. A sixties one, live on stage. Oooh, has someone done some work in cleaning that photo up? When you have a photo of a performance and you were there, the memories are so much stronger. I really remember wishing I was sitting on the other side of the table and not behind the big hairdo's I tried, not that long ago, to find where The Talk of the North used to be, and with a little help from a very nice local, found the spot. Long gone though. Oh, so you were there Carole! It must have been fantastic! I'm a bit envious, Carole. I would pay a lot of money for this experience. No I don't think its been cleaned up Carole, maybe youre thinking of one of the other pics taken at the same time? Yes it does help to have the photos and with hind sight we should have taken more, and at every ocassion that we saw or met her. Yes a pity more weren't taken ,but not like today with easy access to cameras on phones etc., lovely to see them though.. I've often wondered about the colouring of this one too Karen. Tights a bit dark to start with?! Its a nice photo though. Here it is for you in B/W Anita, sorry I can't help with details, you know me I'm hopeless! Someone will know. 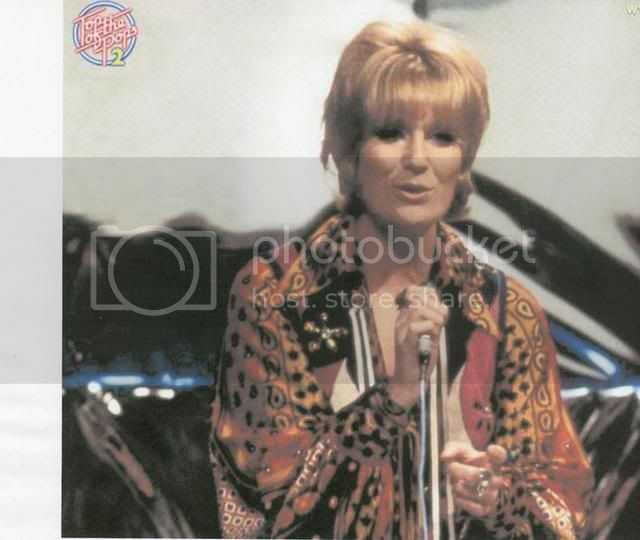 The picture above, if my memory serves me well, was Dusty performing on Top of the Pops, possibly singing "I'll Try Anything". Maybe someone else has other thoughts! ?